The Apple TV is a great little device. It has a number of features I use weekly and has definitely changed the way I consume media in my house. No longer do I have to watch movies or series on my Macbook’s small screen or use messy cables to get my Macbook hooked up to my 42″ LCD TV to get the full experience. *Update! * You can now purchase an Apple TV from Wildtwig in South Africa! The Apple TV connects wirelessly to my home network and hooks up to my TV using a single HDMi cable. Once it’s hooked up to my home network this is where I get the most benefit from it. Using Airplay, whatever photos, movies, Youtube videos or music I would usually consume on my iPhone, iPad or on my Mac, I now tap the Airplay icon and it automatically shows up on my TV! I then use my iPhone or iPad as the remote to browse through the images, stop, start the video or select another song to play. All your content has to be kept within iTunes in order to stream it to your Apple TV. Check out HandBrake for converting movies and series to MP4 which you can then easily import into iTunes. 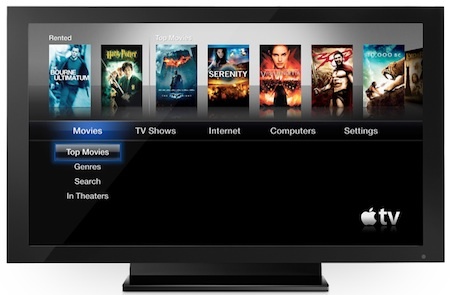 Another killer feature is the ability to rent movies and series from the iTunes stores. You will need an US iTunes account to be able to rent movies and series. Movies cost $3.99 to rent (series episodes are $0.99) and you can keep a movie for 30 days. Once you click play though, you have 24 hours to complete watching it. In terms of speed, I have a 4MB ADSL line at home and most of the time I click download and can start watching a movie literally within a minute. Apple TV does check your line speed and only allows you to start watching when it knows you’ll be able to finish watching the movie without any buffering. iTunes also has a massive amount of online radio stations which you can listen to via your Apple TV. Much better than DStv’s audio bouquet. The biggest problem though is purchasing an Apple TV in South Africa. They are not officially available here and I highly doubt they ever will be. There are a few online stores that do import them. Check stock availability with the online shop before purchasing though. You can buy the 2nd generation or 3rd generation Apple TV from Wildtwig! Other than these stores, hopefully you have a friend in the UK or US that can purchase an Apple TV and send it to you as a gift. They retail for $99 in the US or Â£101 in the UK. I haven’t tried or see the need to jailbreak my Apple TV, but here is a simple guide to jailbreaking your Apple TV. Once jailbroken, you will be able to install XMBC which then turns your Apple TV into a media player without the need to be chained to iTunes. Everyone consumes media differently in their house and the Apple TV isn’t for everyone. I however love the fact I can easily rent movies from my couch, download pictures from my camera to my iPad and with one tap can share the photos on my TV for everyone to see and when people are talking about those funny Youtube videos they saw at work, I quickly find them on my iPhone and use Airplay to stream the videos to my TV for everyone to laugh at. Lastly, one of my most favourite past times is watching movie trailers on the Apple TV. iTunes has a lists most of the movies that are currently in cinemas and although you can’t rent them just yet, you can watch the trailers! What would you do if someone anonymous donor gave you R1 million to do with as you please? Would you quit your job, buy stuff, invest it? Would you retire at 25? I’ll tell you what I’d do. I’d take 6 months (ok, maybe 3 months) off and travel the world to experience as much as I possibly can in that time. I’d then come back to exactly where I live and carry on as if I haven’t been away for 1 day. Obviously the money left over will help whatever ideas I want to pursue, but the point of my post is I wouldn’t drastically change where I am and what I’m currently doing. I’m having that much fun. *Update! * Follow my quick 6 step guide to setting up a US iTunes account from South Africa. Looking to purchase US iTunes gift cards? Use one of the following sites. I’ve purchased from all 4 and they all come recommended! I wrote a post well over 2 years ago about how us South African’s couldn’t buy music on iTunes and that the alternatives we do have are well below par. Well, I thought I’d write a follow up post on how easy it is to actually buy music (and iPhone / iPod Touch applications) on iTunes. So here is a quick guide on how to buy music, movies and apps from iTunes in South Africa. In order to do this, you need to download any free iPhone app from the U.S. iTunes app store, create a new account, select None when they ask for your payment method and fill in the rest of the information. Firstly, make sure you have iTunes installed. Download iTunes from http://www.apple.com/itunes/download/. Click on “iTunes Store” in the left sidebar of iTunes. Make sure you are in the U.S. store, by scrolling to the bottom of the page and clicking the circle icon located bottom right and selecting United States. Once you are in the US iTunes store, find the Free Apps section in the right sidebar of the page. Hover over any of the free apps and click on the free button to try and download it. A popup window will appear where you must click the Create New Account button. Follow the next few steps until they ask for payment. Make sure you use a valid email address, as you going to need it to validate your account. The most important step here is to select None as the payment method when asked to provide billing details. When filling in your billing address, you will need a valid US address. The easiest way to find a valid address is to search for a Mcdonalds, KFC, Walmart, Holiday Inn or any US business using Google maps and then use the address, zip code and state to enter as your address. Once that step is complete, iTunes will send you a confirmation email. You need to click the link in that email to verify the account. Once you have done that, you are now the proud owner of an U.S. iTunes account! If you get the message “please contact itunes support to complete this transaction”, email iTunesStoreSupport@apple.com and explain to them you need to update your address. Try not use one of the more popular business addresses I’ve listed above. Click on the Sign In link in the top right corner to login. Once you have purchased the gift card, you’ll receive an email from them with a code. Click on the Redeem link under the Quick Links section (top right of iTunes Store), enter the Gift Card code and off you go! You can now buy music, apps and movies from the US iTunes store from South Africa! Mail & Guardian ran a feature on 300 young South African’s you should take to lunch. There were a number of categories from Arts & Culture to Sports and I was named in the Technology section. Jason Bagley met his former business partner on Twitter. This may sound odd but it is totally in character for this Generation Y entrepreneur, who professes a dislike of “old-school corporates”. Bagley has little formal education and learned most of his developers’ skills on the job. “I didn’t want to wait three to four years studying before I could start working,” he says. So far, it’s been a good strategy. He’s worked for Trustco Goup International, Travelogic and Younique. Earlier this year, Bagley’s popular, but unofficial My Coke Fest blog, which featured advertising and made use of Coke trademarks, came under fire from Coke. Under threat of legal action, Bagley sanitised and relocated the blog, but retained a loyal community base. He says the incident shows a lack of understanding about how social media works. I had quite an experience this past weekend that really made me sit up and start taking more notice of crime and safety. My FiancÃ© was at the hairdresser on Saturday morning while I was playing a few rounds of golf on my Wii when I received an SMS from her that said the following: “I am in an emergency. Please help me.”. I started to panic thinking the worst – hijacking, kidnapping, etc. and immediately grabbed my car keys and sped out. Just before that I tried to call the cops – who were more than useless. The guy didn’t understand that my FiancÃ© was in an emergency and that could he get someone to go to the hairdresser in Gordon’s Bay immediately. I hung up the phone after the guy kept on repeating “Ehh, what must I do? What emergency?”. I then jumped in my car and called her phone – which immediately answered. I could hear her in the car, with the radio on, but couldn’t hear anything else. I assumed she had sent the SMS somehow and was answering the phone in her pocket. This made me panic even more as I had no idea where she was heading – kidnapped and all. I was in a total panic as I was driving to get to the last place she was in Gordon’s Bay. Her sisters also got the SMS and were calling me, but I had no more information than they did. 3 minutes later I spotted her car at the robot, and there she was, looking all beautiful after being at the hairdresser. I stopped in the middle of the traffic and asked her where her phone was – and she opened her bag and showed it to me. It was a false alarm. I was totally relieved to see her safe and totally oblivious to what I had just gone through in the last 5 minutes. You see, she had activated a function on her phone that sends out an SMS to 4 people she specifies and the phone then goes into SOS mode and auto answers calls from only those people that got the SMS. To activate it, you press the volume key 4 times while the phone is locked. Yes, the possibility of you actually being able to activate it in an emergency might be slim, but at least you have that possibility. Vodacom have a similar function called Look4Help that you can check out if you don’t own a Samsung. Consider setting it up, it could just save your life.